There is no more delicious a combination on earth than the trifecta of pasta, tomato sauce, and mozzarella cheese. 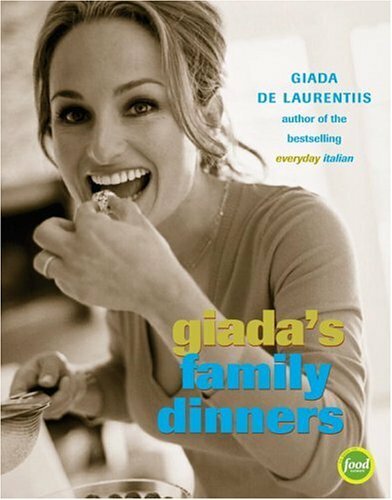 This recipe, from Giada de Laurentiis’s Giada’s Family Dinners, is just awesome. 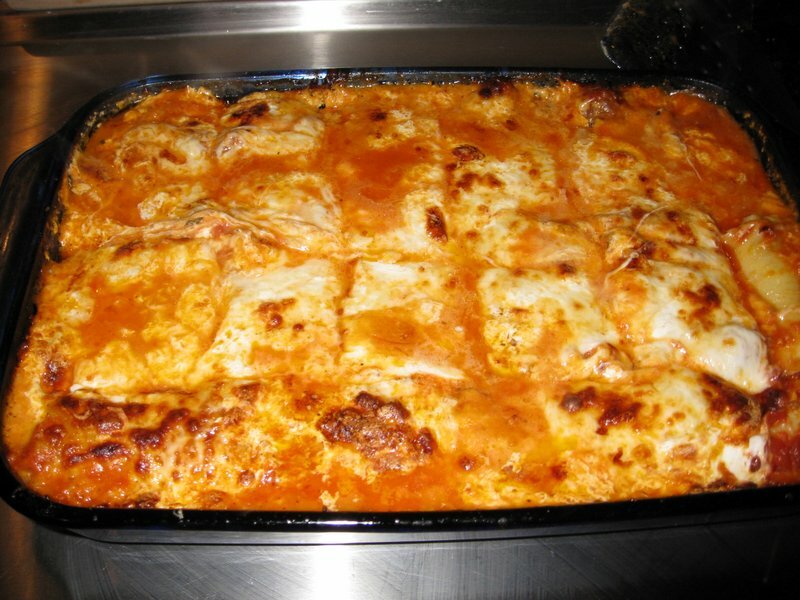 I love to cook and I love lasagne, but I often find it a little overwhelming. So many different recipes to choose from, the choice of straight ricotta and tomato sauce (southern Italian) or bechamel and bolognese (northern Italian), the messiness of trying to serve it. As a Brit, Adam grew up on the northern Italian variety. As an American, I grew up on the southern Italian variety. This recipe combines the best of both, throws in prosciutto, and makes the whole thing easier to cut and serve. I love it, but like with any lasagna be prepared to spend quite a while making it. Once or twice a month I make my own tomato sauce and freeze it. As it happened, today I had to make more sauce. Plus I made bechamel. It took almost 3 hours to put this dish together, including tomato sauce time. I wouldn’t normally make this on a weeknight, but I was home sick today and completely bored by late afternoon. And now we have lunches for the rest of the week. *I usually replace the spinach with some good handfuls of fresh basil chopped up, Adam likes that better. *I use a whole box of noodles, this may be more than 12. Leftovers for lunch. Melt the butter in a saucepan over medium-low heat. Add the flour and cook for 3 minutes, whisking continuously. Whisk in the milk. Increase the heat to medium-high. Whisk the sauce until it comes to a simmer and is thick and smooth, about 3 minutes. Whisk the salt, pepper, and nutmeg into the cream sauce. (This is a bechamel). In a medium bowl, stir together the ricotta, spinach (or basil), 1 cup of the Parmesan, prosciutto, egg, salt, and pepper until blended. Boil a large pot of water on high heat. Add salt. Add the lasagna noodles and cook until tender but firm to the bite (I usually cook 1-2 minutes less than the package directions say). Drain and arrange the noodles on a flat surface so they don’t stick together. Preheat oven to 450 degrees F. Butter a 13 x 9 x 2-inch glass baking dish. Spread the cream sauce over the bottom of the dish. Lay out 3 or 4 noodles at a time and spread 3 tbs of the ricotta mixture on them. Roll them up and arrange them seam side down and not touching each other, on the cream sauce. Repeat with all the noodles. Spread marinara sauce all over the top. Sprinkle with the mozzarella and remaining 2 tbs of Parmesan. Cover the dish tightly with foil. Bake until the rolls are heated through and the sauce bubbles, about 20 minutes. Uncover and bake another 15 minutes, until the cheese on top is golden.Let stand for 10 minutes. Heat some more marinara sauce and serve it on the side in a gravy boat (I usually skip this step and just put more on the lasagna rolls).